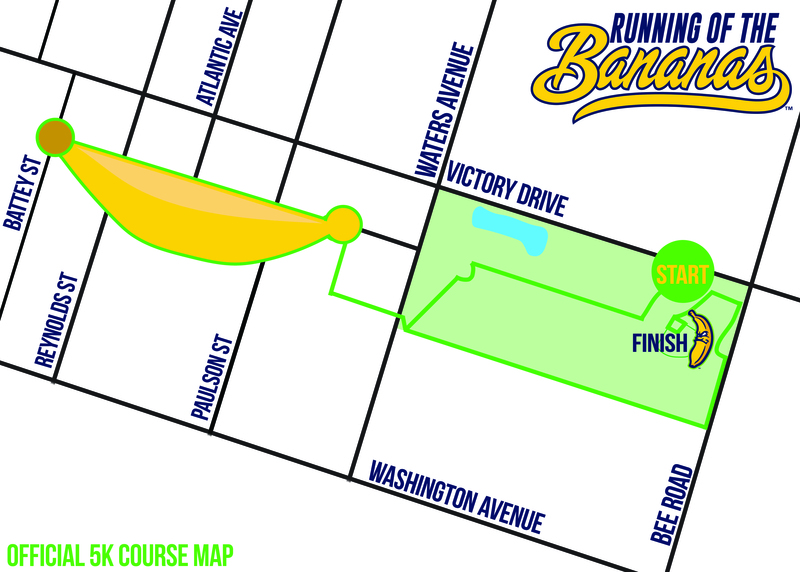 Announcing the first-ever Running of the Bananas 5K with The Savannah Bananas! Celebrate Global Running Day with us by running or walking in this inaugural, epic event! Start Time: 6:30 p.m. | Free kids race starts at 6:20 p.m.
VIB ONLY: Monday, June 4, 10 a.m.-7 p.m., at Fleet Feet Sports Savannah, 3405 Waters Ave. Basic and VIB: Tuesday, June 5, 10 a.m.-7 p.m., at Fleet Feet Sports Savannah, 3405 Waters Ave.
*Please note the below map is not to scale and the actual course has been slightly altered. View the course map on Garmin Connect here.